This will be a text only update. If you're wondering why - well - somebody erased all the latest GoPro footage (that would be me, James.) 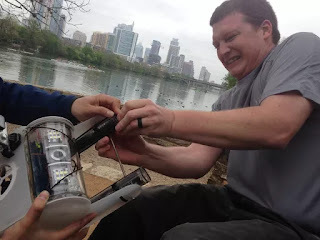 We had a nice little test dive going this past Saturday - a tune up dive to tweak the controls (they're still difficult to use) while we wait for the summer swimming season to die down and for someone/anyone at Jacob's Well to respond to our inquiries. Early in the day, I noticed we had already filled up the GoPro storage - I had neglected to erase the last few dives worth of footage, so I decided to format the card and just capture more footage for the rest of the day. Great plan, right? Unfortunately, we got no more footage that day. There was a leak and the ROV started going nuts on us. We thought perhaps our code tweaks to the motor controls tanked it, but it wasn't actually errant sudo usage but a bad o-ring that sank us. Anything that can go wrong on this project will go wrong. After letting the ROV dry out, it was working fine again, but we were done for the day. So next up, if anyone reading this knows someone that can get us diving access to Jacob's Well, that would be amazing. So far, we've gotten nowhere with them. I'm not above just driving there with the ROV in the offseason and diving it, but I'd rather do this with the cooperation of the county and all. We're as good as we are going to get piloting this thing - it's time to dive.